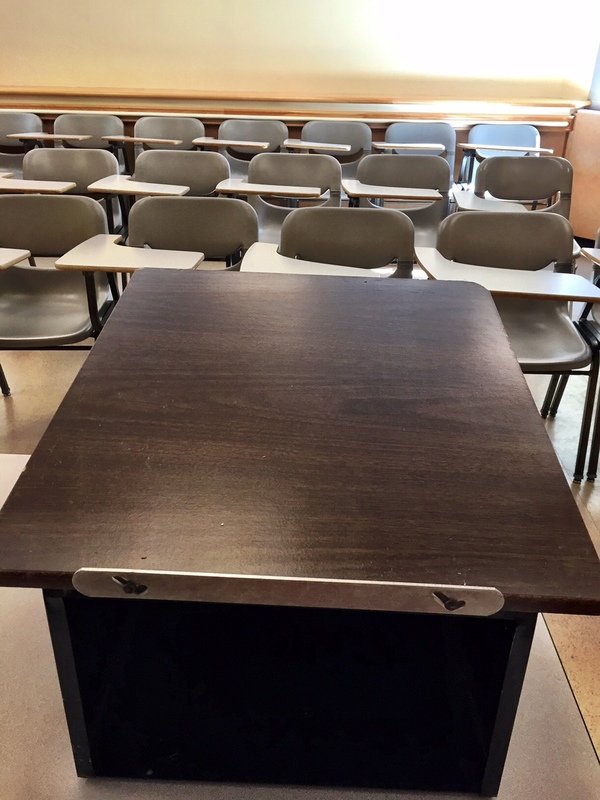 When I first began teaching, the podium in front of the classroom was my safe haven. It was a security blanket that delineated my “instructor zone” and shielded me, at least partially, from the watchful eyes of a classroom full of students. I loved the podium. Some days I literally clung to it, wrapping my hands tightly around its edges as I answered students’ questions. As I gained experience in the classroom, though, things started to go sour. In my graduate pedagogy courses, we talked about the difference between the instructor as the “sage on the stage” versus the often more desirable role of the “guide on the side.” The podium began to feel less like a refuge and more like a pedestal that isolated me, preventing me from truly connecting with the students. As I sat with learners working in small groups, I noticed that conversations were often stunted as I had to make frequent trips up to the podium to advance the presentation. The podium – my old standby – had become jealous, constantly interfering in my interactions with others. Just when I thought that a clean break was impossible, my colleague, Sophie Degât-Willis, shared with me something from her own classroom. She had purchased a projector remote, like this one, and was using it daily in class. I had used these remotes before for conference talks, but it never occurred to me just how useful it would be for the classroom. It was a simple matter of attaching the remote’s receiver into the classroom computer’s USB drive and, just like that, I was free. It has been over two years now that Sophie and I have used these remotes in our classes, with very positive results. Below is a short list of specific ways in which we have used this simple gadget to positively impact classroom dynamics. Relinquishing control to increase learner agency (Kara). I have used the remote at the beginning of class to invite students to lead the day’s warm up. Handing over the remote symbolically gives a student control of the class, akin to passing a baton. The students may lead from the front of the class if they are comfortable, but can also stay in their seat. The latter is much less intimidating than bringing someone up to the “stage” (i.e. podium). From instructor-centered to interactive vocabulary presentations (Sophie). I have used a remote to sit with the students (or behind them) and have them negotiate the vocabulary instead of me just presenting it. I show them images and we see how many words they can produce collectively. After we’ve gone through all the images, I show them again without the labels, and they need to name the objects or people as quickly as possible. Sitting with them makes it less intimidating, and they are more willing to propose words they are not so sure about – perhaps because we are all looking at the screen (instead of me looking at them). Using remotes to be part of the discussion (Sophie). I like to sit with them in a semi-circle and let the students lead the discussion with the discussion questions on the screen. In this case not standing in front of them allows me to be a participant. I intervene when I have something to say (such as a counterpoint), but I don’t moderate or mediate their interaction. Students still sometimes seek eye contact with me for approval, but usually they tend to look more toward their audience rather than just me (as they used to do when I was standing by the screen). Sometimes the magic happens, and the discussion gets so interesting and involving that they seem to forget that I am even there! Most presentation remotes integrate with Powerpoint and Prezi presentations. Please note that most remotes don’t work with Google slides, but that you can download the Chrome “Presentation remote” app on your Apple or Android smartphone to use as a remote with either a Mac or PC computer. Since remotes utilize a general USB receiver, it does not matter if your institution uses Mac or PC machines. Higher-end remotes will function as a mouse as well. If you have an iPhone and an Apple computer, you can use your phone as a remote using this app. Do you use a remote in your classroom? Let us know in the comments! « Have you seen the 2015 teacher draft?